After almost a century of activity, Dadashi Art Gallery™ is internationally known for high quality original oil paintings. With the largest focus on Canada, United States and Iran, we ship paintings to all corners of the world; we are crossing geo-political, cultural and religious borders and increasing communication through art. 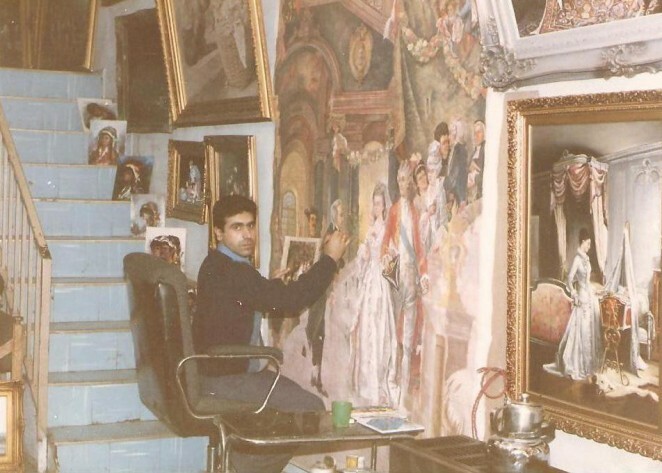 The first Dadashi Art Gallery™ was opened in 1920 in Baku, Azerbaijan by Eman Dadashi and today, the Dadashi family operates three galleries in Tehran. Aby Dadashi, Eman’s grandson, established the first Dadashi Art Gallery™ in Toronto in 1989 and has since earned a reputation for his outstanding work and services within the Canadian art community. Community – Contributing to society and demonstrating social responsibility by initiatives that impact lives outside the gallery. Trust and Integrity – Representing ourselves with honesty and matching our behaviors to our words because we believe that long lasting relationships are grounded in trust. Value – We earn our fee, not just collect it. We work hard on all our projects to find value through efficiency and creative execution and are committed to great products and service. Initially offering only paintings, the gallery has expanded over the years to offer a wide range of products and services. Our collection now focuses on original pieces of classical paintings, decorative art, Persian rugs and carefully selected furniture. We also carry a selection of affordable artwork which allows access to art for all enthusiasts. Some of our most sought after services include art restoration, custom framing and private commissions. We strive to ensure all our visitors feel welcomed to our gallery. Our knowledgeable staff often spends a considerable amount of time with clients to educate and narrow down the right piece for their space and budget. We work closely with the artists we represent and are enthusiastic about delivering art that makes you happy. Open 6 days a week, we aim to create an accessible and inspirational art gallery for all. If you have any questions please feel free to call us on +1 416 250 6050 or reach us via email at info@dadashigallery.com. Please visit us the next time you’re in the Greater Toronto Area! The Canadian Association For Conservation promotes responsible preservation of the cultural property that gives Canadians a sense of place, of history and of artistic expression. Click the image to learn more. Eman Dadashi’s father owned a cheese and butcher shop in Baku, Azerbaijan where he worked from the age of seventeen. He began his artistic career with sketches of animals, as he had gained a detailed understanding of their anatomy through working with his father. Eman’s father wasn’t thrilled about this new line of work, but he gave his son an opportunity to explore his own career. He created a shoe-box sized studio for Eman at the back of the butcher shop in 1920 and this became the first Dadashi Art Gallery™. 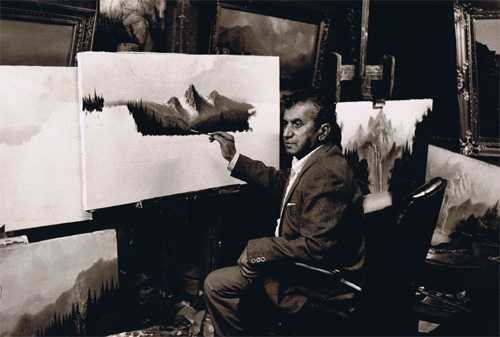 Dadash and his family settled in the North of Iran –being naturally artistic he took over the direction of the gallery in 1944. He would often travel to Tehran to sell his artwork to galleries and private collectors. The family moved to Tehran and eventually opened an art studio on Shahpoor Street, in one of the main commercial districts at the time. Eventually, the shop grew and moved to “Sakhtehmoon Pelasko” – a 20 floor shopping mall in Tehran. Dadash gave birth to a family of artists, all nine boys eventually made their way into the art world and this allowed Dadash to acquire more commission contracts. With the increased demand, they moved to a larger location on Valley Asr (“Pahlavi St.”). The family opened two further locations in Tehran – one in the Jordan district and the third shop in the Motah-hari neighbourhood and all three are still in operation today. Aby’s artistic path was always clear to him and his career began at an early age while working at the family gallery. He later enrolled at the Faculty of Arts of Tehran’s University, where he extended his theoretical knowledge of arts. With his wife and two children, Aby lived in Germany and Spain, where he was exposed to different movements and techniques, which have influenced his artistic vision of the world. He later moved to Canada with his family and opened the first Dadashi Art Gallery™ in Toronto in 1989. Having over 40 years of experience, European influence, knowledge and appreciation for art, Aby has cultivated a diverse collection of fine art. The emphasis of his early work has been on traditional oil paintings and sculpture, and in more recent years, on Canadian landscapes, private commissions and restoration projects. You can read more about Aby’s story via his autobiography page.